The United States will fall well short of its 2025 greenhouse gas reduction target unless major additional steps are taken, according to a new report. While U.S. states, cities and companies have promised to step up their efforts to fight climate change as the Trump administration pulls back, the report finds their actions will not be enough to meet the emissions reduction pledge the United States made in the 2015 Paris climate agreement. But the report outlines steps that can get the United States "within striking distance of the Paris pledge." Former New York mayor Michael Bloomberg's philanthropy is releasing the study, entitled "Fulfilling America's Pledge," to coincide with a major conference on global action to tackle climate change taking place in San Francisco. Under the Paris agreement, the United States promised to reduce its greenhouse gas emissions by 26 to 28 percent compared to 2005 levels by 2025. U.S. emissions were down 12 percent in 2016, the latest data available. Economic forces are helping push emissions down, the study notes, regardless of President Donald Trump's intention to pull the United States out of the agreement and his administration's efforts to roll back climate regulations. Coal-fired power plants are closing faster than ever, despite Trump's support for the industry, and renewable energy continues to expand rapidly. 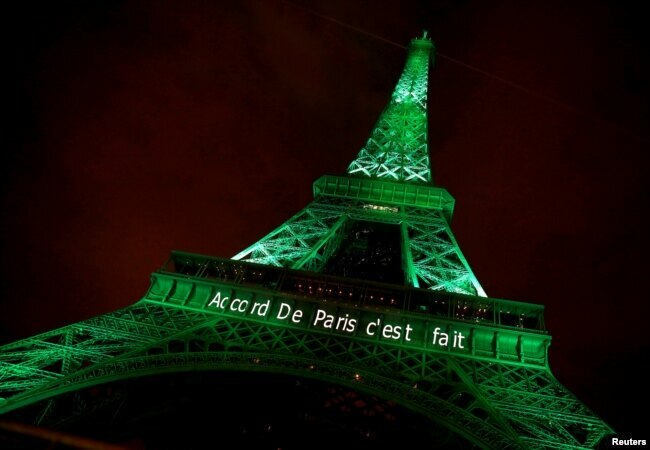 However, many states, cities and businesses remain committed to the Paris agreement. If this "coalition of the willing" were a country, the report says, it would be the world's third-largest economy. Their actions currently put U.S. emissions on track to drop by 17 percent by 2025. However, that falls far short of the Paris pledge. The report lists 10 "high-impact, near-term, and readily available" strategies to accelerate progress. They include speeding up the transition from coal to renewable energy; increasing electric vehicle use; improving building efficiency; and stopping leaks of methane, a potent greenhouse gas.